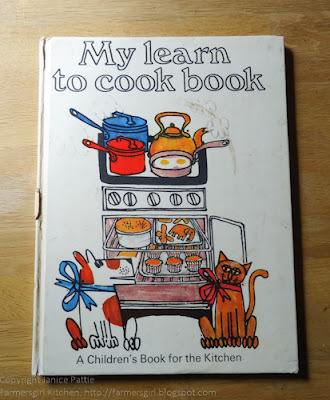 I've posted about my first cook book before, but here it comes again courtesy of some nostalgic tweets and Facebook posts from Claire at Foodie Quine when she found was reunited with a copy of The Brownie Cookbook, her own first cook book. Claire and I have set up a Linky so that you can join in and tell us about your first cookbook too. I thought I would make something from My First Learn to Cook Book by Ursula Sedgwick, illustrated by Martin Mayhew. The book which was a gift from my Great Aunt and the illustrations are probably my favourite thing about it and probably why I still have it. The book features a full range of recipes and includes a section on Safety in the Kitchen and Weighing and Measuring. There is an eggsellent section on EGGS (sorry), Boiled, Fried and Scrambled, then on to the more exotic Ox-eye Eggs and Eggs in Tomatoes. Then on to Egg and Egg Whisk with instructions on how to whisk an egg white, how to separate eggs and what to do with the yolks leading you on to make...Meringues, Apple Snow and Baked Alaska. I used to read that recipe again and again, I must have made it too, as there is dried on egg white on the page! The chapter finishes with a delicious Chocolate Mousse. More Sweet treats follow with Crispy Crackolates, Peppermint Creams, Marzipan Dates and Coconut Ice. Fat and Flour...make Pastry, and also Fruit Crumble, Zoo Biscuits (including how to make your own cutters), Quiche Lorraine, Fruit Tartlets and Sausage Rolls. Butter, Eggs, Flour and Sugar are for Baking this chapter starts by explaining basic techniques like creaming the butter and sugar, folding in and beating. Greasing your tin and flouring the tin. Oven Dos and Don'ts and how to tell if your bakes are 'done'. Finishing by telling you how to get the cake out of the tin. Reading this again, all I could think of was how useful this would be for contestants in the Great British Bake Off! Baking recipes are Chocolate Drops, Fairy Cakes, Birthday Name Cake and Ice Cream Gateau. And so to Cheese and Meat are for Lunch or Supper. 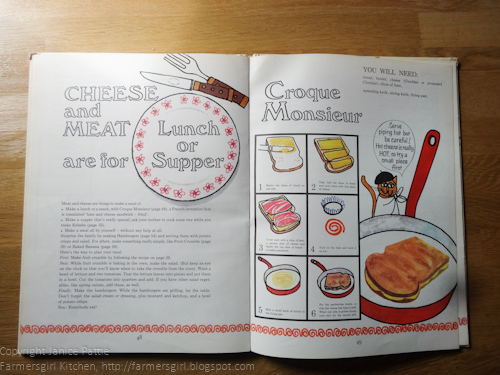 Croque Monsieur was another one of the recipes I enjoyed reading and I loved the little cat with his French beret. So I decided to make this recipe for my lunch the other day. You will need: bread, butter, cheese (Cheddar or processed Cheddar), slices of ham. 2. 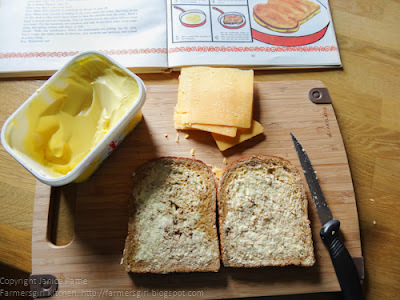 Take half the slices of bread and cover them with thin slices of cheese. 3. Cover each with a slice of ham, and second slice of cheese and finally the top slice of bread - to make a sandwich. 4. Turn on the heat and leave on low. 5. Melt a small knob of butter in the frying pan. 6. Fry the sandwiches slowly, so that the cheese has time to melt,. When one side is golden brown, turn and fry the second side. I managed to slightly burn the bread, probably should have had the heat down a bit. Anyway, it wasn't completely incinerated and I was able to eat the lovely oozing cheese with the salty ham and crispy toasted bread. Remember there were no sandwich toasters or Pannini makers in the home when this book was written. Other recipes in this chapter are Cheese Baked Potatoes, Pizza Pie, Hot Dogs, Hamburgers and Kebabs. The final chapter is about Fruit with some more unusual recipes using fruit jams, fruit juice, fruit flavoured jellies and fruit itself. Fruit Fried Sandwich, Baked Bananas, Lemon Fizz, Knickerbocker Glory and Fruit Salad. Apart from the fact that the measurements are not in metric, this book has stood up well and would still be appealing to the child aged 7-12 it was aimed at. All the basic cooking and baking techniques are there and it's presented in a really fun way. Love this book and I love it that you've just used it again after all these years. I felt so nostalgic when I used mine a couple of years ago to make crackolates. Mine resides at my mother's and I very annoyingly forgot about this event when I was there yesterday or I could have picked it up. Not sure I will be able to get it now, but I guess I could link up to my last post. I'm so impressed that you have managed to keep hold of your first cookery book. Kudos to you. 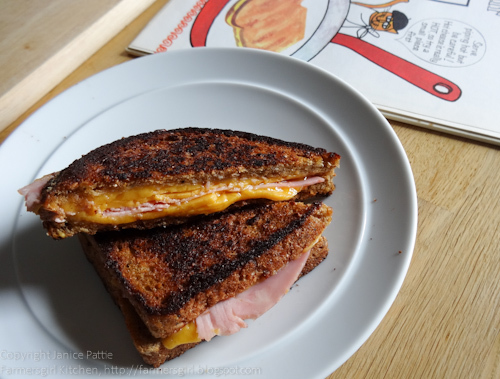 Never tried to make croque monsieur at home - I must bookmark this page! Yay, I managed to get hold of it after all. Yours looks in much better condition than mine.